Join experienced yoga teachers and bodyworkers Daniel Orlansky and Jennifer Yarro as they teach the art of yoga posture adjustments that are safe, effective, practical, and joyful for both receiver and giver. Adjustments given during yoga practice help to release deep structural tension and open energetic pathways. In Hands-On! Skillful Assists for Yoga Asana a variety of basic yoga positions are presented, including forward bends, back bends, twists, standing, and reclining poses. Hands-On! Skillful Assists for Yoga Asana will take you on a hands-on adventure to deepen your asana practice as a teacher and a student of yoga. Rent or Download Coming Soon! 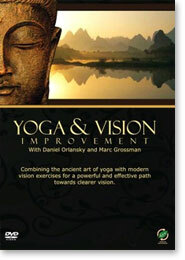 Created by Behavioral Optometrist Marc Grossman, O.D., and yoga teacher Daniel Orlansky, Yoga and Vision Improvement brings together the best of eastern and western eyes methods for healing your vision and helping you see more clearly. This 45 minute DVD will systematically take you through natural eye exercises, gentle yoga stretches, and simple movements that will relax your body and the eyes. The 4 “Bs” of breathing, blinking, brushing, and beaming are taught, which are natural and effective ways to improve and protect your eyesight for years to come.